Revised kinematics, not just dropped knuckle. 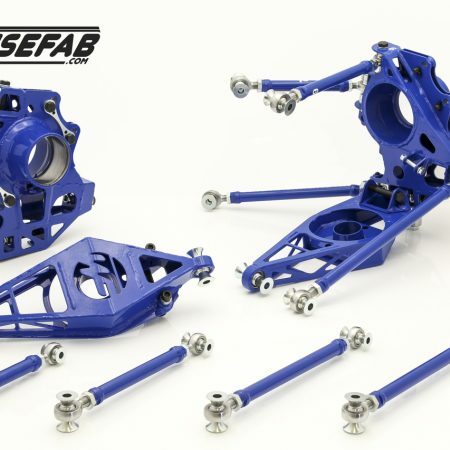 If the focus is more towards performance, then the car can act better with lowered ride height, but then the factory designed kinematics wouldn’t work as it supposed to. 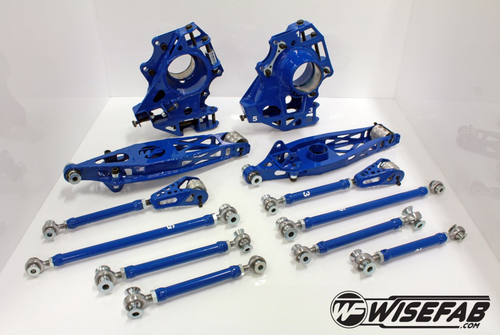 The Wisefab kit would give a good kinematics with lowered car – higher roll center, , revised cambergain, anti-squat and bumpsteer for maximum grip. Easy camber adjustment – As the top links are straight tubular type, then camber can be adjusted simply by changing their length. Bump steer adjustment – Possibility to adjust bump steer by changing rod end location in a slot. Anti-squat adjustment possibility – Possibility to adjust anti-squat by changing the top forward link height on upright. It can be done in less than 10 minutes at the trackside. Lowering link would increase anti-squat, raising it would decrease anti-squat.